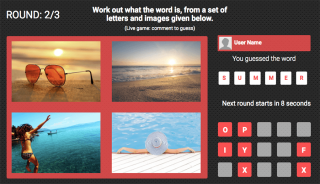 Create a live streaming 4 Pics 1 Word game to post on your Facebook page and engage your followers in a fun way. New words every game round due to random generation. Start the online game with one click and enjoy together with fans. At the end of the game 1 final winner will be chosen so you could use it for facebook live giveaway. Stop waiting. Start engaging your audience! © 2018 LiveReacting.com. All Rights Reserved.